On May 15th 1986 (forty-seven years and two months after becoming incumbent), the Rev'd T.E.M. 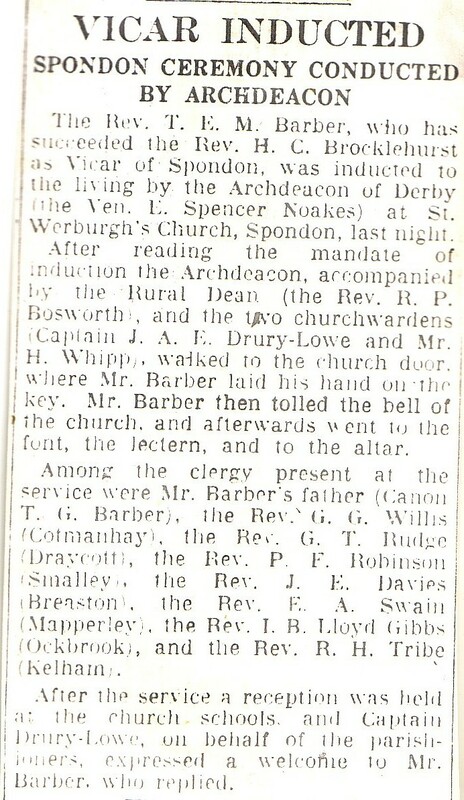 Barber retired as Vicar of Spondon. He was the longest-serving vicar in the United Kingdom at the time, and will go down in history as the longest-ever serving Vicar of Spondon. The Vicar's last services the previous Sunday were witnessed by large congregations who packed the church to hear the Vicar celebrate the service of Holy Communion in the morning and to preach at Evensong. Later in the week, on the eve of his retirement, a presentation was made to Mr. Barber by the Patron of the Living, Captain Drury-Lowe, and messages of goodwill were read from well-wishers from all over the world. Amongst those was a letter from the late Archbishop of Canterbury, The Most Reverend Michael Ramsey, who had been Mr. Barber's senior at Repton School, and under whom he had studied at Lincoln Theological College. Dr. Ramsey was too ill to attend the function but, in his letter, he wrote warmly of Mr. Barber and of his great Ministry which (in the words of Dr. Ramsey himself) had been of far greater value than his own as Archbishop. 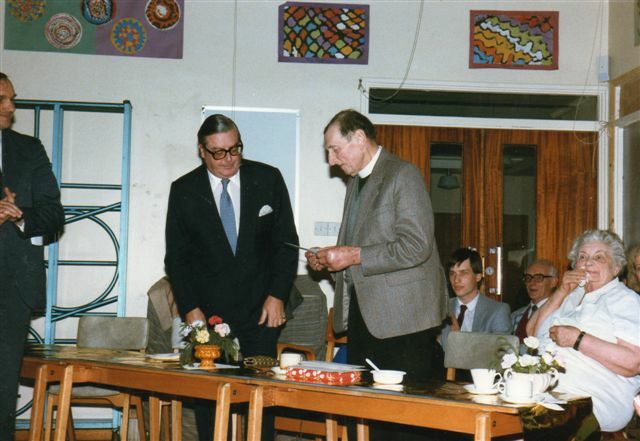 Thanks to one of our members (who has been searching through his archives) we are able to hear again Mr. Barber's farewell address to Spondon which he gave at Evensong on Sunday, 11th May 1986. In his address (which may be heard by clicking the link to the mp3 file) Mr. Barber spoke of two momentous days in his life. And the second was the day he must resign as Vicar of Spondon. Earlier that Sunday, Mr. Barber had celebrated Sung Mass the last time as Vicar. We are able (thanks to one of our members who recorded the service) to hear an edited version of this service, and to relive, what for many of us was, a real spiritual experience: - the Vicar celebrating Holy Communion. The Vicar gives the Blessing.